I really like these... I could eat the filling part like a salad... mmmmm ! Cut tops off peppers, about 1/2-inch. Remove and discard stems and seeds. Dice tops of peppers and transfer to a medium bowl. Set bowl aside. In a small saucepan, heat 1-1/2 tsp. oil. Add garlic and couscous and stir until garlic is light golden and fragrant. Add 2 cups water and bring to a boil. Reduce heat to low, cover and simmer 8 - 10 minutes, until liquid absorbed. Remove from heat and let stand 5 minutes. Fluff with fork. Grill peppers about 8 minutes, turning occasionally until all sides are lightly charred. Remove peppers from grill and let cool. Brush zucchini with oil and grill 3 - 5 minutes, turning until lightly charred and tender. Remove from grill and let cool. Dice zucchini and add to diced peppers. Add couscous (I only added half of what I cooked), beans, feta, sun-dried tomatoes, basil, vinegar, remaining oil, pepper and salt to bowl with diced peppers and zucchini. Mix well. Stuff each grilled pepper with mixture, lightly packing filling throughout entire pepper. 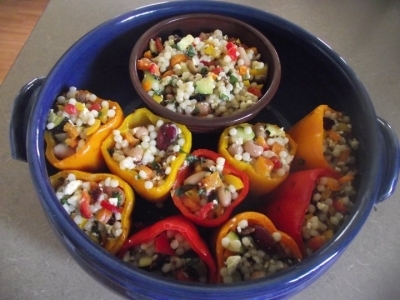 Wrap each pepper in plastic wrap and refrigerate at least 1 hour or over-night (maximum). I propped mine up in a dish and covered with plastic wrap.